As voting continues for the NZNO Presidency, it’s heartening to hear that more members seem to be using their democratic right to choose our leader this time round. At CCDHB, members and delegates have been lucky over the past few years to see Grant in action as a delegate and supporter of all our members. Some of our delegates were keen to share their reasons for supporting Grant with members from other workplaces. Simon Bayliss, a delegate in Theatres (right), said there was no doubt in his mind that Grant was the man for the job. Women’s Health delegate Ann Simmons (right, at this year’s ANZAC Dawn Parade) said NZNO members deserved Grant as president in today’s difficult political environment. Kenepuru Surgical Unit delegate Emma Brooks said Grant was truly passionate about frontline RNs, HCAs, ENs and midwives. “He has not lost sight of the day to day struggles we face, or become lost in the corporate bureaucratic quagmire. 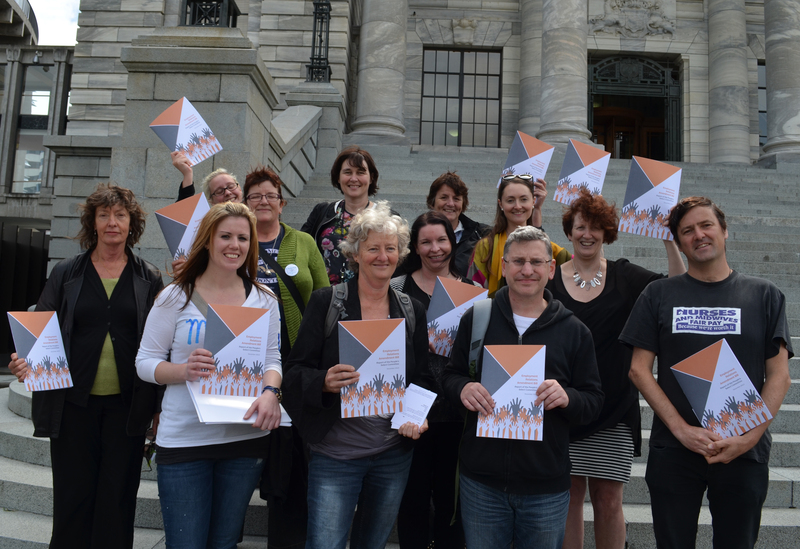 Delegate Kathryn Fernando from the Kāpiti Health Centre (front row, centre, at the presentation of the People’s Select Committee Report on the ERA in 2013), supports Grant because of his energy, passion, intelligence and commitment to social justice. PACU delegate Katrina Hopkinson (centre) said she found Grant approachable and a great mentor. Ward 6 North delegate and Enrolled Nurse Anita Te Kahu (pictured at the CTU Fairness at Work rally in 2013) is another long time colleague who has seen Grant in action over the years. Asked why she supports Grant, her answer is simple. “Why the hell not? He’s the only one that is worth it! “He is a people’s person, approachable, a listener and a thinker. Committed to a mission, he does not give up. As the new NZNO President, Grant will continue to be our mouthpiece and fight for what is right. And finally, as CCDHB’s lead RN delegate, I have worked closely with Grant on many issues affecting our members, including safe staffing, underpaid shift leave, personal grievances and budget cuts. His commitment to our members and to our union values is unmatched by any other candidate. If an issue needs sorting or a members needs support, Grant is there – frequently on his day off or after a tough night shift. Vote Grant Brookes for president. Members should have received an email with instructions on how to vote online on 19 June. (If you haven’t, check your spam folder). Or, if you’re one of 8,000 or so members without a current email address on file with NZNO, you should have received voting papers in your letterbox. If you haven’t received either, phone the Member Support Centre on 0800 28 38 48. Remember, democracy is only as strong as the number of us who have our say!